to end violence against women and girls. Concerned about the lack of accountability on violence against women and the daily headlines on this violence worldwide, a group of women’s rights activists met at Harvard’s Carr Center for Human Rights on June 3, 2013 to discuss the need for a treaty. The meeting was pivotal. The advocates at the table—a global group that included forced marriage expert Vidya Sri, women’s rights activist Lisa Shannon, and human rights expert Charlie Clements—agreed that a treaty on violence against women and girls would close the gap in the legal framework, leading to better protection for women worldwide. Lisa and Vidya agreed to lead the effort and spent two years reaching out to women’s rights activists around the world to build a global working group. 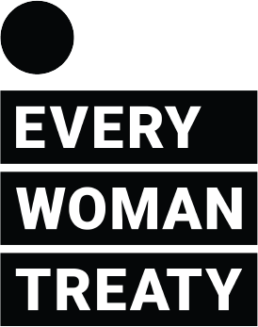 Advocates working in a wide range of areas, from women’s empowerment and poverty elimination, to legal status and the rights of widows, indigenous people, and others, came together to launch Every Woman Treaty in 2015 under its original name, Everywoman Everywhere. With Vidya and Lisa’s leadership, the Working Group spent the next three years laying the foundation for a treaty. They grew the group’s membership to 127 experts representing every region of the world—a groundbreaking and unprecedented level of women’s leadership and global inclusion in treaty development. And conducted extensive policy work on treaty development. In late 2018, Every Woman Treaty pivoted from its development phase to the public campaign: a global initiative to amplify the call for a treaty to end violence against women and girls. We envision a world where every woman and girl everywhere can realize her human right to a life free from violence. In the face of the global culture of impunity on violence against women, the Every Woman Treaty mainstreams the right to a life free from violence for every woman and girl, everywhere. We work to eliminate this violence worldwide by mobilizing a global movement and advancing a treaty to prevent violence against women and girls. 1. We believe every woman and girl has a right to a life free from violence. 2. We believe that the massive gaps that exist in the legal framework and global implementation on violence against women must be addressed. 3. We believe a global treaty on violence against women violence against women will be a substantial step forward in protecting women and girls from violence. 4. We believe effective policy grows from real-world expertise of human rights practitioners and survivors. 5. We believe in engaging a diverse community in the effort to end violence against women and girls. 6. We believe men and boys must play a critical leadership role in ending violence against women and girls. 7. We believe in a foundation of rigorous research and policy analysis. 8. We believe success is founded on respect, professionalism, listening, hard work, creativity, honesty, and relentlessness. Lisa Shannon, MPA, HonPhD, Cofounder, CEO. Lisa is a women’s rights activist and scholar who has worked in women’s rights since 1991. Her first job out of college was in domestic violence shelters in her hometown of Portland, Oregon. She has conducted field research on gender in India, Russia, Somalia, Iraq, Guatemala, Kenya, and Congo. She is known for initiating campaigns in the international women’s movement, including founding Run for Congo Women and cofounding the first sexual violence crisis center in Mogadishu, Somalia. She is the author of the award-winning A Thousand Sisters (Seal Press, 2010) and Mama Koko and the Hundred Gunmen (Public Affairs, 2015). Lisa was a Fellow of the Carr Center for Human Rights (2013–2014), and a Gleitsman Fellow with the Center for Public Leadership (2012–2013) at the Harvard Kennedy School. She holds an honorary Doctorate in Humane Letters from Georgetown University (2013). Vidya Sri, MBA, Cofounder, President. Vidya is a women’s rights activist, scholar, and leading expert on forced marriage. As the founder of Gangashakti, an organization that raises awareness and conducts research and training on forced marriage, she conducted groundbreaking research that brought the reality of forced marriage in the United States to the surface, giving women access to resources for the first time. She was a Human Rights Policy Fellow at the Carr Center, Harvard Kennedy School (2013–2016), where she led the Initiative on Violence Against Women, which examined the legal and implementation gaps in the global framework on violence against women, the groundwork for the Every Woman Treaty. Prior to women’s rights work, Vidya was a vice president in the banking industry, where she led teams of 150 people, and managed assets exceeding $1 billion. Charlie Clements, MD/MPH, Cofounder, Steering Committee Member. Charlie is a veteran human rights activist. He represented Physicians for Human Rights during the International Campaign to Ban Landmines signing and at its Nobel Peace Prize Ceremony. He has served as Executive Director of the Carr Center for Human Rights Policy at the Harvard Kennedy School, Adjunct Lecturer in Public Policy, and faculty member of the Harvard Humanitarian Initiative. As a physician working in El Salvador during the civil war, he cofounded and led the Salvadoran Medical Relief Fund and Pax Americas, a political action committee, and led a number of Congressional fact-finding missions in Central America during the 1980s. He is the author of Witness to War, his account of that experience (Bantam, 1984). TYPES OF VIOLENCE: Simi Kamal (and Zainab), Pakistan; Marina Pisklákova-Parker, Russia; Ghada Hammam, Egypt; Katarzyna Sękowska-Kozłowska, Poland; Virginia Muwanigwa, Zimbabwe; Tanyi Christian, Cameroon; Cristina Ricci, Australia; Ghada Hammam, Egypt; Uuree Uuriintsolmon, Mongolia; Sopheap Ros, Cambodia; Sheena Kanwar, Singapore; Adolf Awuku Bekoe, Ghana; Valerie Khan, Pakistan; Pei Yuxin, China; Taskin Fahmina, Bangladesh; Monica McWilliams, Ireland; Jeanne Sarson, Canada; Peg Hacskaylo, USA; Dr. Denise Kindschi Gosselin, USA; Khedija Arfaoui, Tunisia; Katarzyna Sękowska-Kozłowska, Poland; Kelly Jones, Burundi / USA; Angela Hefti, Switzerland; Hauwa Shekarau, Nigeria; Anyieth D’Awol, South Sudan; Manizha Naderi, Afghanistan; Virginia Muwanigwa, Zimbabwe; Joy Ngozi Ezeilo, Nigeria; Joanna Smętek, Poland; Gaby Razafindrakoto, Madagascar; Reena Tandon, Canada; Laurie Tannous, Canada; Tanyi Christian, Cameroon; Jo-Anne Dusel, Canada; Shawn MacDonald, USA; Michal Sela, Israel; Orit Sulitzeanu, Israel; Carolyn Rodehau, USA; David Wofford, USA. Abir Ahmed, India; Lindsay Apperson, USA; Carla Benton, USA; Millicent Bogert, USA; Karolina Deuth, USA; Taylor Dutch, USA; Veronique Fourment, USA; Arianna Frontera, Italy; Maria Gargano, USA; Sasha Grossman, USA; Meredith Gusky, USA; Yogitra Jothi, UK; Nancy McLennan, UK; Anna Nikoltchev, France; Caitlin O’Quinn, USA; Maria Pachon, USA; Seyoung Park, USA; Matt Spangler, USA; Arianna Stefencavage, USA; Caitlin Stone, Australia; Maddalena Zarcone, USA.